Wags tail and idles about. 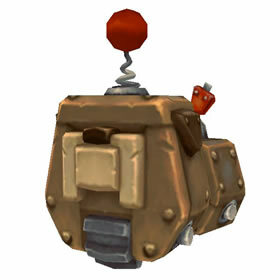 This pet is rewarded when your character completes the "Toybox Tycoon" achievement. To complete this achievement, your character must possess at least 400 unique toys. am 12 8 toys away from hitting I now have this achievement the last toy was triggered by Blizzcon. Always nice to have something to work towards and nice knod to the pet community as the previous achievement linked to toys was a mount. Reboot is identical to Repair, not sure why Blizzard did this. It figures that my not collecting toys would come back to haunt me. Now I will probably spend hours, days, weeks, and months trying to go from 250 toys to 400 just to get this pet. Built with ever-wagging tail technology, Brutus is a mechanically-certified good boy.